I went to the US for 90 days on an ESTA in August to November. Then back to my home country for 1 month and then back again mid December until mid February and now I am going back again after 10 days for another 90 days. Now I can see that some people refer to 180 day rule in a year. My stay will be 240 days in one year with short gaps between coming back. Is the 180 day rule accurate? Some people write that you can do unlimited trips to The US as long as you don't stay more than 90 days. Is that correct? My reason for going there the first time was to visit and travel with an American friend. After my first visit (she is my girlfriend) moved with me to my home country but has ended up in a custody battle in the US so she needed to return urgently so I returned only to be with her and support her, not to be a tourist. Then after my second visit I needed to go back to my sick Dad and to rent out my apartment since we left in a rush to go back to the US. Now, my third visit is to continue to be with my girlfriend and support her in her difficult situation. My question is, if I do end up in trouble should I tell them this whole story? Or should I just say I am visiting a friend for a third time because I want to see more of the country and I have some more time off before I go back to my job. There exists no formal rule requiring any amount of time between visits; purely as a matter of law, nothing prevents you from staying for 90 days, flying home for a day, coming back to the US for 90 days, going home for a day, ad infinitum. However, the fact that you qualify for VWP does not mean you'll be allowed to enter the country. When you seek admission, there is a presumption that you're trying to immigrate -- you need to convince the CBP officer that you're not, and that you will obey the terms of your status (that you'll leave when you're supposed to, you won't work, etc.) If you're repeatedly coming to the US for long periods of time with little time spent back home, in order to be with your girlfriend who's living here, that can look very much like you're trying to basically live in the US, which is not what the VWP is for. If I were a CBP officer, I would be rather suspicious of anyone who's trying to use what's fundamentally a short-term program for tourism and business to be in the US for almost three quarters of a year. Expect suspicion at the border, and know that you may well be denied entry based on the officer deciding you're trying to make an end-run around immigration. Bring lots of documentation of ties to your home country. 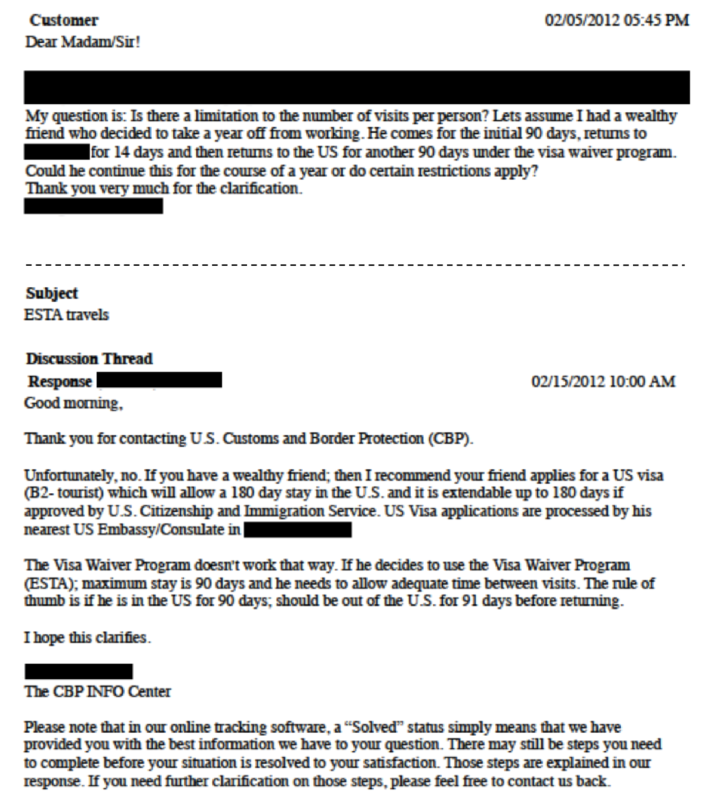 No matter what, do not lie to the CBP officer. Lying to gain admission is a crime, and if caught comes with a guaranteed lifetime bar from entering the United States. There are no rules. Anyone citing any rule is wrong. This is it. Convince the CBP officer that you do not live there and you are good to go. I am entering speculative land This sounds to me, a random stranger on the Internet who is not a CBP officer, does not know their procedures and so on that despite your return ticket (which can be cancelled) and your apartment (which can be sold) you are preparing to wed and stay which might cause them to deny you. There is no specific rule for how long someone can spend in the US under the VWP program, other than obviously the maximum 90 days per entry. However there is an often stated "rule of thumb" which is that you should remain out of the US for longer than you have been in the US. So, for example, after a 90 day stay it would be expected that you would stay outside of the US for 90 days before re-entering. This is not a hard-and-fast rule, as you've already discovered, having already entered for two 90 day periods with only one month between them. However you now find yourself in a position where you have been in the US for ~25 weeks, but only out of the US for about 5 weeks - and are trying to enter for what could potentially be a further 12 week period. Nobody other than the immigration official who is actually processing you can say if that's going to be "too long", however based on the rule of thumb above and reports of others who had tried multiple entries like this, your odds are being allowed into the US are, at best, low. The fact you have a girlfriend in the US does not help you, and likely hinders your entry, as it increases the probability that you are entering the US to live there (which, after spending 6 out of the past 7 months in the US it's hard to claim you're not) - however claiming otherwise won't help your story otherwise either. As is always the case with immigration, if you do choose to attempt to re-enter the US the best option is always to not offer any information unless you are asked a question, but if you are asked a question always answer truthfully. Your odds of being allowed entry are low at the moment, but your odds of being allowed entry if they catch you in a lie are zero. And remember, as you're entering on the VWP, there is no right of appeal. If the immigration officer refuses your entry, then his decision is final. You will be put on a flight out of the US, your ESTA will be canceled, and as you have now been refused entry from the US you will likely not be able to return any time soon, and almost certainly not allowed re-enter using the Visa Waiver Program for at least several years. Vist US for 90 days ( VWP), leave and return for 70 more days; is that a problem? What supporting documents do I need to bring on a trip to the US on a previously used B1/B2 visa?